Frequent exacerbations of chronic obstructive pulmonary disease (COPD) have negative effects on quality of life and survival. Thus, factors related to exacerbations should be determined. We aimed to evaluate the effects of thyroid function on quality of life and exacerbation frequency in COPD patients. The study population (n = 128) was divided into 3 groups (Group 1: COPD patients with hypothyroidism (n = 44); Group 2: COPD patients with normal thyroid function tests (n = 44); Group 3: Healthy subjects (n = 40)). Pulmonary function tests, maximum inspiratory pressure (MIP) and maximum expiratory pressure (MEP) measurements were performed. Quality of life questionnaire (Short Form 36, SF-36) was carried out. Patients were followed up for one year and number of exacerbations was recorded. FVC, FEV1/FVC, and FEF 25–75% measurements were statistically different between group 1 and 2 (p = 0.041, p = 0.001, p = 0.009 respectively). Although MEP values were significantly different between group 1 and 2 (p = 0.006), there was no significant difference in MIP values between groups (p = 0.77). Quality of life scores in group 1 and 2 were significantly lower than control group. 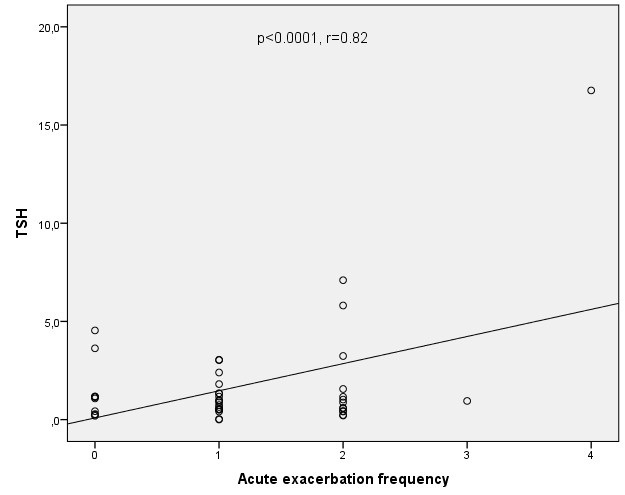 Exacerbation frequency was significantly higher in group 1 than in group 2 (p = 0.017). TSH values and exacerbation frequency had positive correlation (p < 0.0001; r = 0.82). The results of the present study suggest that thyroid function has an effect in exacerbation frequency of COPD. Decrease in exacerbation numbers with early detection of impairment in thyroid function will have positive contribution on quality of life in COPD patients. Chronic obstructive pulmonary disease (COPD) is a respiratory disease with systemic complications, which is characterized by chronic airflow limitation due to destruction of lung parenchyma and airways . Many systems including endocrine system are affected in COPD. Extrapulmonary effects of COPD and comorbidities diminish quality of life, aggravate symptoms and increase mortality [2–4]. Thyroid hormones play an important role in the regulation of thermogenesis and metabolism. Serum thyroid hormone levels change during systemic illnesses. Previous studies reported changes in thyroid hormone levels in respiratory diseases . Hypothyroidism may also cause alveolar hypoventilation, decreased lung volumes, upper airway obstruction, depression in respiratory stimulus and respiratory failure. Hypoxia and decreased ventilatory response to hypercapnia have been demonstrated in patients with hypothyroidism [6, 7]. Diaphragmatic dysfunction and myopathia can be seen in patients with hypothyroidism. Inspiratory and expiratory muscle strength is linearly related to the degree of hypothyroidism [8, 9]. The myopathic manifestations may be related to impaired expression of myosin heavy chains IIb or to impaired neuromuscular transmission . Thyroid function of COPD patients has been investigated in previous studies and different results have been found . Hypoxia and hypercapnia cause destruction in sellaturcica and pituitary gland dysfunction. During the course of COPD, together with hypoxia, peripheral metabolism of thyroid function changes and thyroid hormone levels decrease in patients with very severe COPD [12, 13]. Previous studies have also shown altered thyroid function during COPD exacerbations . To the best of our knowledge the effects of thyroid function on acute exacerbations frequency in COPD patients have not been investigated so far. We hypothesized that impaired thyroid function may contribute to the impaired quality of life and increase exacerbation frequency in COPD patients. Thus we aimed to investigate quality of life in COPD patients with and without hypothyroidism and to determine a relationship between acute exacerbations frequency and thyroid function. A prospective case control study was conducted in COPD patients. Institutional review board of our university approved the protocol and informed consent form was signed by each participant. COPD patients who have been regularly followed up at outpatient clinics of Pulmonary Diseases Department of Baskent University Faculty of Medicine in Ankara, Turkey, between August 2009 and December 2010 were recruited to the study. Medical history, physical examination, pulmonary function tests (PFTs), chest X-rays; thyroid function test results of all patients were recorded in order to establish the diagnosis of COPD and hypothyroidism. Diagnosis of COPD was based on current Global Initiative for Chronic Obstructive Lung Disease (GOLD) guidelines . All COPD patients were ex-smokers and stable at the time of the enrollment in the study. Patients with mild, moderate and severe obstruction were recruited to the study. COPD patients with impaired thyroid function test results were examined in the department of endocrinology. Further diagnostic investigation was performed if needed in patients with hypothyroidism to reach an accurate diagnosis. Patient groups (COPD patients with and without hypothyroidism) were composed of patients with similar age, gender and degree of airflow obstruction. The number of patients with severe airflow obstruction was the same in each group. Patients with severe obstruction received additional inhaled corticosteroid treatment. Patients during acute exacerbation of COPD, and who received systemic corticosteroids, medications containing iodine, amiadorone and/or contrast material within prior two months, those who could not perform the pulmonary function tests, those with thyroid surgery, other endocrine diseases (including diabetes mellitus), neuromuscular and cardiovascular diseases, symptoms of any infections or using anti-inflammatory medications, and patients with hypoxemia were excluded from the study. Age and gender matched control subjects were selected from healthy subjects with normal thyroid function and without any systemic diseases and smoking history. We divided study population (n = 128) into three groups (Group 1: COPD patients with hypothyroidism (n = 44), Group 2: COPD patients with normal thyroid functions (n = 44), Group 3: Healthy subjects (n = 40)). Venous blood samples were collected into blood collection tubes with red cap at 8 a.m. following an overnight fast. Thyroid stimulating hormone (TSH) (normal range: 0.35–4.0 mIU/L), free triiodothyronine (FT3) (normal range: 2.3–6.7 pmol/L) and free tetraiodothyronine (FT4) (normal range: 10.2–24.4 pmol/L) were measured with using electrochemiluminescence immunoassay (E170, Mannheim, Germany). Patients with elevated serum TSH levels (higher values than 4.0 mIU/ml) and a low serum FT4 concentration were diagnosed as primary hypothyroidism, whereas patients with normal FT4 concentration in the presence of an elevated TSH concentration were diagnosed as subclinical hypothyroidism. Patients with secondary (central) hypothyroidism had a low serum FT4 concentration and a serum TSH concentration that was not appropriately elevated. 32 COPD patients with primary hypothyroidism, 4 COPD patients with secondary hypothyroidism, and 8 COPD patients with subclinic hypothyroidism were included in the study. Pulmonary function tests were performed with a clinical spirometer (SensorMedicsVmax spectra 229, Bilthoven, The Netherlands). Maximal expiratory flow maneuver was performed by patients and control subjects. Forced expiratory volume in 1 second (FEV1) and forced vital capacity (FVC) values were obtained and FEV1/FVC was calculated. Standard PFTs including spirometry and lung volumes were evaluated according to the previously described guidelines . Patients with post-bronchodilator FEV1/FVC <70%, and irreversible airflow obstruction were recruited to the study . Post-bronchodilator FEV1 values were used to define disease stage according to the GOLD severity classification . Respiratory muscle strength was assessed by measuring the maximal inspiratory pressure (MIP) reflecting the strength of the diaphragm and other inspiratory muscles, and the maximal expiratory pressure (MEP) reflecting the strength of the abdominal muscles and other expiratory muscles . A hand-held Micro RPM (respiratory pressure meter) was used to measure respiratory muscle strength . The technician explained the procedure before the test and demonstrated the correct manoeuvre. The SF-36 questionnaire was used to evaluate quality of life (QOL). This questionnaire has been previously validated for COPD patients [19, 20]. The subjects’ daily routine activities, social life and exercise performance were determined based on 36 questions of this item. Main eight domains as physical function, social function, physical and emotional role limitation, mental health, pain, vitality, and general health perception were found. A computer algorithm was used to score the responses to the SF-36 . Diagnosis of an exacerbation relies on clinical presentation of the patient complaining of worsening symptoms (dyspnea, cough or sputum production) and leading to an increase in the use of maintenance medications and/or supplementation with additional medications that is beyond normal day to day variations . All patients were followed up for one year after the enrollment to the study and number of exacerbations was recorded. The data regarding the exacerbation frequency were collected via regular outpatient visits every 3 months, hospitalizations, emergency room admissions and telephone calls on a thorough review of patient’s symptoms. The statistical analyses of our study were performed using SPSS statistical software version 20.0. The variables were investigated using visual (histograms, probability plots) and analytical methods (Kolmogorov Smirnov test) to determine the normality of distributions. The results were expressed as mean ± standard deviation and median value (min-max range). ANOVA was used to compare parameters with normal distribution among study groups (group 1, 2, and 3). Levene’s test was used to assess homogeneity of variances. P less than 0.05 was accepted as significance level. When an overall significance was observed pairwise post hoc tests were performed using Tukey’s test for homogenous variances and Tamhane’s T2 test for heterogenous variances. For continuos variables without normal distribution Mann–Whitney U test was used for the comparison of the two groups (patients with and without hypothyroidism), whereas Kruskal-Wallis test for the comparison of parameters among 3 groups. T- test was used for the comparison of parameters with normal distribution between 2 groups. The parameters affecting acute exacerbation frequency were investigated using Pearson and Spearman correlation analysis. Fisher’s exact test was used to compare disease stages in two groups. A multiple linear regression model was used to identify independent predictors of acute exacerbation frequency. The model fit was assessed using appropriate residual and goodness of fit statistics. Demographic data and pulmonary function test results of our study population are demonstrated in Table 1. Age, body mass index (BMI), height and weight were not different among study groups. Post hoc analysis showed that MEP values were significantly different between group 1 and 2, and group 2 and 3 (p = 0.006; p = 0.018 respectively). Cigarette pack/year, FEV1/FVC, FVC (liter and %), and FEF%25–75 were significantly different among the three groups (Table 1) (group 1 vs 2, group 1 vs 3, group 2 vs 3). Data are expressed as mean ± SD for parameters with normal distribution and median for parameters with skewed distribution (range min-max). Where P is significant, values within a row with the same superscript letter are significantly different. BMI, Body mass index; COPD, Chronic obstructive pulmonary disease; F/M, Female/Male; FEF25–75%, Forced expiratory flow at 25–75%; FEV1, Forced expiratory volume at 1 second; FVC, Forced vital capacity; MEP, Maximal expiratory pressure; MIP, Maximal inspiratory pressure; SF-36, Short form-36; TLC, Total lung capacity. We also compared pulmonary function test results of group 1 and 2 and did not find statistically significant difference in terms of FEV1 (L and %) (p = 0.637, p = 0.339, respectively). FVC (litre), FEV1/FVC, FEF%25–75 (litre/sec) were significantly different between group 1 and 2 (p = 0.041, p = 0.001, p = 0.009, respectively). We found a significant difference in MEP values between group 1 and 2 (p = 0.006), but not in MIP values (p = 0.77). TSH values were significantly different between group 1 and 2 (p = 0.04) (Table 2). Disease stage of patients in group 1 and 2 was not different (p = 0.169) (Table 3). COPD, Chronic obstructive pulmonary disease; FEF25–75%, Forced expiratory flow at 25–75%; FEV1, Forced expiratory volume at 1 second; FT3, Free triiodothyronine; FT4, Free tetraiodothyronine; FVC, Forced vital capacity; MEP, Maximal expiratory pressure; MIP, Maximal inspiratory pressure; SF-36, Short form-36; TSH, Thyroid stimulating hormone. SF 36 scores in group 1 and 2 were significantly lower than in control group (Table 1). There were no significant differences between Group 1 and 2 in terms of SF 36 scores (Tables 1, 2). We found positive significant correlations between FEV1 (L) and scores of SF-36 domains (FEV1 with physical activity p < 0.0001, r = 0.582; FEV1 with physical role limitation p < 0.0001, r = 0.488; FEV1 with general health p < 0.0001 r = 0.534; FEV1 with vitality p < 0.0001 r = 0.434; FEV1 with social functioning p < 0.0001, r = 0.534; FEV1 with emotional role limitation p = 0.001 r = 0.412; FEV1 with mental health p = 0.001, r = 0.398). Acute exacerbation frequency of group 1 was significantly higher than that of group 2 (1.5 ± 0.85 and 0.86 ± 0.83 respectively; p = 0.017) (Table 2). When we evaluated the relationships between TSH values and demographic data and SF 36 domains, we found significant relationships between TSH and BMI and mental health (p = 0.033, r = −0.323; p = 0.037, r = −0.315; respectively). There were no significant correlations between TSH and MIP, MEP, FEV1 L and FVC L (p = 0.146, r = −0.228; p = 0.117, r = −0.246; p = 0.906, r = −0.018; p = 0.405, r = −0.129; respectively). Acute exacerbation frequency was not correlated with MIP and MEP values (p = 0.51, r = −0.103; p = 0.167, r = −0.214 respectively). FVC L, FVC%, FEV1 L, FEV1% were negatively correlated with exacerbation frequency (p = 0.008, r = −0.391; p = 0.002, r = −0.448; p = 0.01, r = 0.380; p = 0.042, r = −0.304 respectively). A positive significant relationship between acute exacerbation frequency and TSH values was found (p < 0.0001; r = 0.82) (Figure 1). Multiple linear regression model was used to determine the contributing factors to exacerbation frequency. Only TSH was found to be significantly associated with acute exacerbation frequency (p < 0.0001) (Table 4). Relationship between thyroid stimulating hormone (TSH) levels and acute exacerbation frequency of COPD. COPD, Chronic obstructive pulmonary disease; FEV1: Forced expiratory volume at 1 second; FVC, Forced vital capacity; TSH, Thyroid stimulating hormone. To our knowledge, the present study is the first one investigating quality of life and exacerbation frequency in COPD patients with and without hypothyroidism and the relationships between thyroid functions and exacerbation frequency in COPD patients. Dyspnea, exercise limitation, depressed psychological mood, comorbidities and exacerbations are main factors affecting quality of life in COPD patients . Increased perception of dyspnea decreases physical activity and dyspnea aggravates during limited physical activities so as a vicious cycle is formed. Evaluation of quality of life in COPD patients with SF-36 questionnaire is an easy and helpful method already demonstrated in previous studies [23, 24]. We determined significantly decreased scores of SF-36 domains in COPD patients with and without hypothydroidism than in control subjects and FEV1 values were significantly correlated with SF-36 scores in accordance with the previous studies [25, 26]. In a recent population based study thyroid hormone status and health related quality of life were investigated and scores of subjects with suppressed TSH values or markedly elevated TSH values were not significantly lower than those of subjects with normal or mildly elevated TSH values . However, to our knowledge, up until our study the quality of life in COPD patients with and without hypothyroidism has not been evaluated. In the present study SF-36 scores of COPD patients with and without hypothyroidism did not differ significantly. Therefore we can conclude that hypothyroidism is not a factor affecting quality of life in COPD patients. This result should be addressed in the future prospective investigations with larger sample size of COPD patients. In several diseases, the evaluation of respiratory muscle strength is very useful. It is known that a reduction of MIP and MEP has been associated with several neuromuscular diseases, but it is also possible to detect decreased values of MIP and MEP in COPD patients . Malnutrition, muscular atrophy, steroid-induced myopathy, pulmonary hyperinflation and reduced blood flow to the respiratory muscles are contributing factors to respiratory muscle weakness in COPD patients [29–31]. Diaphragmatic dysfunction in hypothyroidism, and inverse relationship between TSH and inspiratory and expiratory muscles’ length have been previouslyreported [7–9]. In the present study MEP values were significantly lower in patients with hypothyroidism than in those without it. This result confirms the adverse effects of hypothyroidism on expiratory muscles. However we did not find a significant difference in MIP values between patients with and without hypothyroidism and no significant correlation between MIP and MEP values and thyroid function. These results might be due to the characteristics of our study population as we did not include patients with very severe COPD, with hypoxemia and neuromuscular disorders, or those who have received systemic corticosteroids. Besides, similar FEV1 values and disease stages of COPD patients with and without hypothyroidism may affect these outcomes. Exacerbations of COPD are important events in the course of disease as exacerbations negatively affect quality of life, accelerate the decline of pulmonary function, and are associated with higher socioeconomic costs and mortality [1, 32]. Development of strategies to prevent exacerbations is an important goal in COPD. In the present study we determined that exacerbation frequency in COPD patients with hypothyroidism was significantly higher than in COPD patients without hypothyroidism and we detected a significant relationship between TSH values and frequency of acute exacerbations. Moreover, we strengthened our hypothesis with linear regression analysis, because we found that the only significant determinant of exacerbation frequency was serum TSH levels in our study population. The limitation of our study was failure to convince higher number of patients to participate in the study. Further studies with larger sample sizes are needed to confirm and explore the findings of the present study. In conclusion, our preliminary study demonstrates a significant relationship between TSH levels and COPD exacerbation frequency which suggests that the detection of impairment in thyroid function can decrease exacerbation number and improve quality of life in COPD patients. The data set supporting the results of the present study is present within the article. SSU: M.D., Assistant Professor in Afyon Kocatepe University, Medical Faculty, Department of Pulmonary Diseases, Afyon, Turkey. SSB: M.D., Associate Professor, in Baskent University, Medical Faculty, Department of Pulmonary Diseases, Ankara, Turkey. ZEO: M.D., Physician, in Baskent University, Medical Faculty, Department of Pulmonary Diseases, Ankara, Turkey. BAO: M.D., Physician, in Ankara Ataturk Chest Diseases and Chest Surgery Training and Research Hospital, Ankara, Turkey. GU: M.D., Professor, in Baskent University, Medical Faculty, Department of Pulmonary Diseases, Ankara, Turkey. The authors would like to thank Elif Erdem for her technical assistance. SSU designed the study, conducted the study, collected and analyzed data, and prepared the manuscript. SSB helped in analysis of data and prepared the manuscript. ZEO and BAO helped in the conduction of the study and collection of data. GU helped in the conduction of the study, and preparation of the manuscript. All authors read and approved the final manuscript.